MAX is getting a good bit of attention and the questions are rolling in, so I've started Jack's MAX FAQs to answer them. We have a Build Your Own MAX page for folks who want to build their own ultra-high-mileage car on a low bucks budget. We ran MAX against the motorcycles at the Craig Vetter Fuel Economy Challenge at AMA Vintage Days, Lexington, Ohio, July 22, 2011 and we surprised everybody (me included) with 127 miles per gallon in mixed rural, town, and freeway driving. "We've added panel mounting instructions, updated the windshield mounting instructions, made some improvements to our Dzus fastener page. , (What's a Dzus fastener? Guess you need to click the page to find out), and improved our adjustable control arms page. Also check out our preliminary PVC suspension simulator info on LocostUSA. A Locost in its natural habitat—on the edge of the desert east of the Sierra Nevada mountains, chock full of camping gear and headed for Las Vegas. This is MAX, our high mileage multifuel street racer, on its way to win Escape from Berkeley. Click the pic to read more. The same car two years later, with the streamlined body that makes it a 100-plus MPG cruiser. Click the pic to see how we did it. The car in the photos above is MAX, which stands for Mother's Automotive eXperiment. No, we're not done with it yet, for 2012 it's getting a roll cage and a removable top. The engine is a turbocharged 1100cc Kubota diesel, and and even sans streamlining MAX was surprisingly peppy. 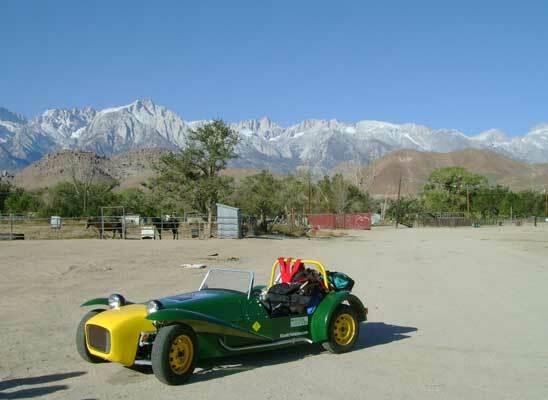 Peppy enough to win the inaugural Escape from Berkeley race in October '08 (Berkeley to Las Vegas without petroleum fuel) thanks to good performance, great mileage, and the ability to run on cooking oil straight out of the bottle. We'd planned to run the same team (Yours Truly behind the wheel and Sharon Wescott behind the map) in some other events but Sharon passed away so for future rally competitions, we'll be calling for volunteers in the right seat. 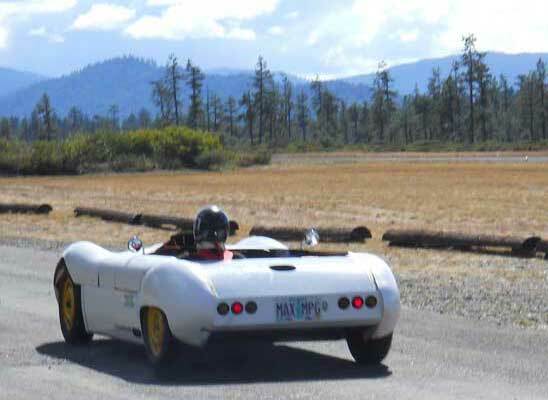 Meanwhile, we build and distribute a variety of Locost and Haynes Roadster chassis components and fiberglass body parts, and design new devices and techniques to improve the breed. MAX is a bit unusual, most of our users are making serious high performance cars with 5 to 10 times MAX's horsepower, it all depends on what you want and we're here to help you make a car that meets your particular goals. Please don't tease our web site. Just because I got Dreamweaver doesn't make me a web designer.